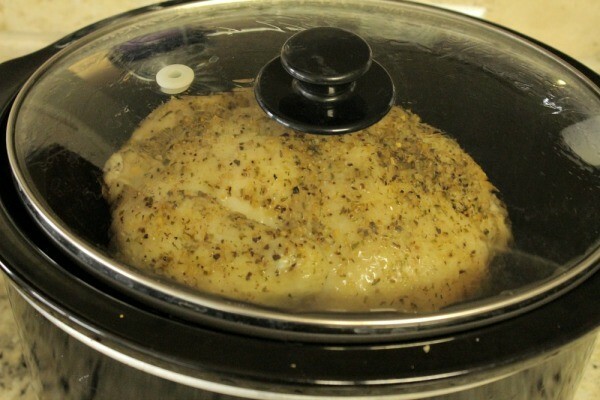 If you would like to know How to Cook a Whole Chicken in the crock pot, you are in the right place. The method I use is easy and the chicken turns out perfect every single time. I cook a whole chicken every week, shred it up and use it for shredded chicken recipes, rotisserie chicken recipes, Chicken Pot Pie, Mexican Chicken Rice Bowl and salads. It’s also delicious rolled up in a corn tortilla with a little bit of homemade pico de gallo and cheese. Who’s hungry now? If you’re looking for easy, low fuss dinner ideas that are loved and devoured by your family members, shredded chicken recipes are always a big hit. I used to purchase Rotisserie chickens at my local grocery store and then it hit me…why not make my own? I know the kind of chicken I’m purchasing, I’ll know exactly what ingredients are added to it and I’ll know how it was prepared. 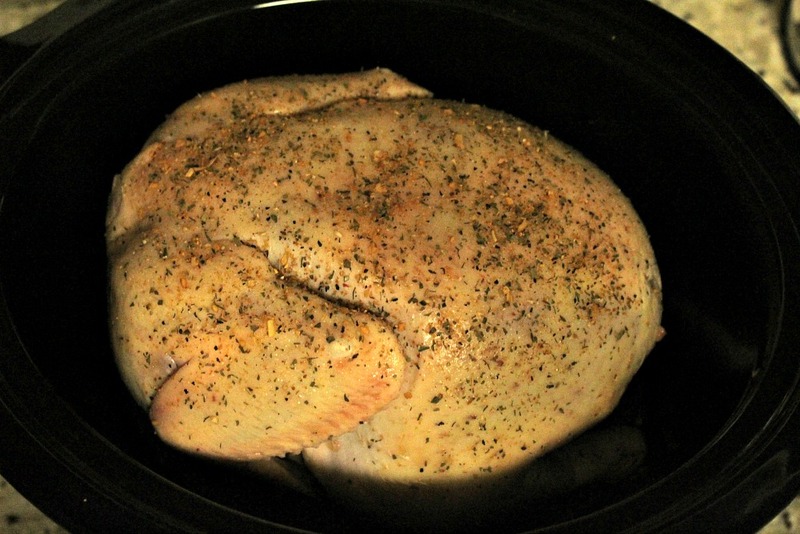 I can put it in the crock pot in the morning and shred it before dinner prep or I can put it in at night, right before I head to bed and wake up to a prepared chicken. 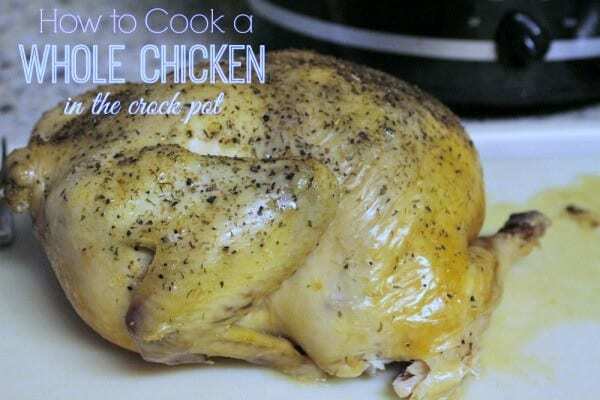 Here’s how to cook a whole chicken in the crock pot. Place 4 balls of foil in the bottom of your crock pot to create a little rack for the chicken. This allows you to remove the chicken much easier when it’s done. Place the chicken in the crock pot. Some people do it legs up, some do it legs down. I’ve done it both ways and it turns out perfect which ever way it’s placed. When you’re roasting a chicken, you do it legs up. Season your chicken. For this particular chicken, I used salt, pepper and Montreal Poultry seasoning. Yesterday I cooked one with a little bit of BBQ sauce and salt and pepper because I’m using it for BBQ Chicken sliders. Play around with the seasoning and create something you love. If you know you’ll be using this chicken for a Mexican food recipe, sprinkle on some taco seasoning. Cover and cook on high about 5 hours or on low for about 8 to 9 hours. It really depends on the size of your chicken (this is a 5 lb. bird) and the strength of your microwave. I always use a meat thermometer to make sure its internal temp is 165 degrees F.
If the chicken is done and you’re not ready to shred it yet, just put your crock pot on the ”keep warm” setting. I do this just about every time I cook a whole chicken in the crock pot and I think something magical happens during this time. When the chicken is ready, place it on a cutting board and let it rest for about 15 to 20 minutes before shredding. After it rests, shred it up! 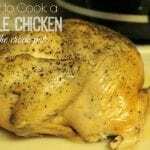 You will be amazed at how easy this is to do because the chicken falls off the bone and shreds so nicely. I just use two forks to shred it up. 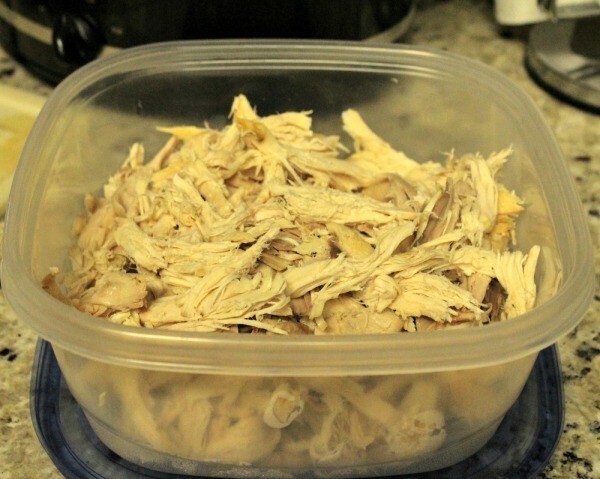 After you’re done, you’ll have a container full of shredded chicken ready to use in recipes throughout the week. This last whole chicken I made was enough for chicken pot pie, chicken soup and chicken quesadillas. Since I purchased this whole chicken for .97 a pound, which made it around $5 – I’d say that’s a deal for three meals! A flavorful, tender, moist whole chicken recipe you can shred and use in hundreds of different recipes. This helps take the stress out of dinner prep. 1. 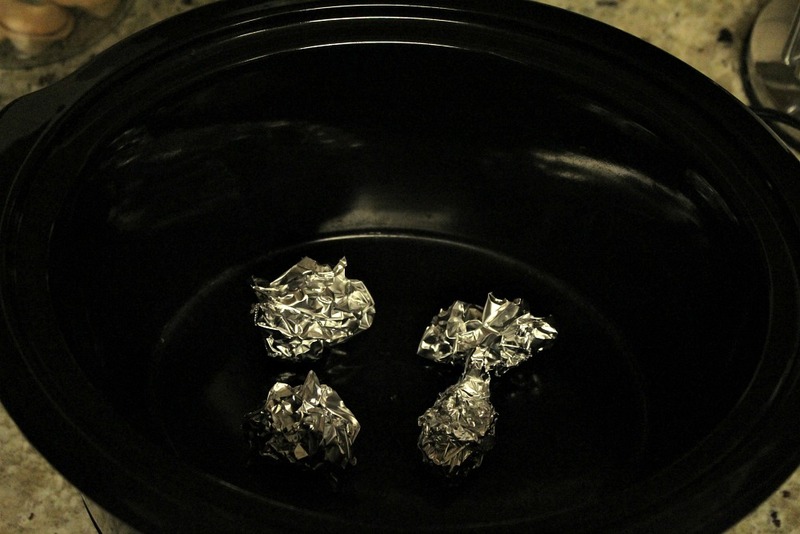 Place 4 foil balls on the bottom of your crock pot. 2. Place your whole chicken (be sure to check for the neck and other chicken pieces inside the cavity and discard those) on the foil balls. 3. Season with salt, pepper and Montreal Poultry seasoning. 4. Put the lid on and turn your crock pot to high (about 5 hours) or low (about 8 to 9 hours). 5. Check the internal temperature of your chicken with a meat thermometer. It's ready when it reads 165 degrees F.
6. Remove the chicken from the crock pot and let rest for about 20 minutes. 7. After it's rested, shred the chicken with two forks. 8. Enjoy and use in different recipes all week! Shredded chicken freezes really well. Place the shredded chicken in a freezer safe Ziploc bag. Write the date on it and stick it in the freezer. Pull it out of the freezer the night before you plan to use it and thaw it in the refrigerator.